In the autumns of 2014 and 2015 a programme of fieldwalking was undertaken as part of the Flodden 1513 project. The aim of the fieldwalking section of the project was to look for artefacts that may have been associated with the movement of the Scottish and English armies to and from Branxton, where the Battle of Flodden took place in 1513. To provide some background information, fieldwalking involves setting out a grid plan on a field. Volunteers then walk sections of that grid, recording any artefacts and labelling them so that at a later date the distribution of finds can be plotted on a distribution map. This enables archaeologists to identify any “hotspots” of finds that would warrant further archaeological investigation. In discussion with landowners, fields were selected based on proximity to sites associated with the battle and to ensure that the timing of the fieldwalking would not cause any damage to crops. Once the fields had been selected a baseline was established. From this baseline a 50m grid was laid out using measuring tapes and an optical square to ensure that each corner was a right angle. Each 50m grid square was then sub-divided into 10m x 10m squares. 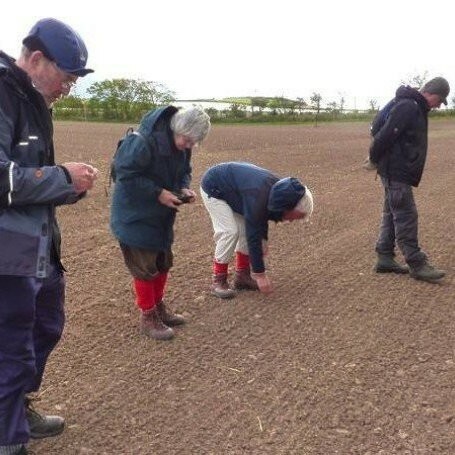 A number of different approaches can be used in fieldwalking; on this occasion the method was designed to sample the field rather than to cover it completely, in order to cover a large area more efficiently with the resources available. Pairs of volunteers would walk on either side of each 10m grid line, collecting and labelling any artefacts recovered. In 2014 two large fields were selected in Branxton, which were believed to be within the area occupied by the English army immediately prior to the battle. We spent three days fieldwalking, drawing a total of 14 volunteers, most of whom were members of TillVAS (Till Valley Archaeological Society). Both fields were composed of loamy silty soil and had been seeded with wheat and rolled, which gave us an opportunity to fieldwalk prior to the crop sprouting. The warm overcast weather on day one was ideal for fieldwalking because the contrast of objects with the soil and the lack of shadows made spotting finds a lot easier. Days two and three were sunny and we enjoyed the good weather to work in. Finds were multi-period (from worked flints to 21st century tractor parts), reflecting the long history of cultivation and occupation. The second field was very close to the Battle site, and we spent four days there. The weather was a mixture of overcast skies with bright sunny spells and it was warm for the time of year. We had 31 volunteers over the four days coming from TillVAS, Ashington and Scotland. Again, the finds were multi-period and included a variety of pottery, buttons and a beautifully made lead spindle whorl. The final fieldwalking season was in 2015 and the site selected was in Ladykirk. The landowner and Scottish Borders archaeologist were contacted and we were granted permission to fieldwalk. We were initially delayed by rain but then managed to spend two days fieldwalking with a total of 6 volunteers. The field was loamy and had been planted with rapeseed that had sprouted but the landowner was happy that we posed no threat to the crop. The weather was dry and warm and the field yielded a mixture of finds including a large volume of broken medieval pottery. Unfortunately we were not able to do any further fieldwalking in 2015 due to the volume of rain and its effect on the soil. In concluding I would like to take this opportunity to thank all the volunteers for their hard work. Without them none of this would have been possible. I would also like to extend my thanks to the Landowners who kindly gave us permission to fieldwalk on their land.